Cheap, good quality, good color. It seems possible to grow good flowers and trees. This review is about item#23778843. For replacing the soil of the flower bed. It is a beautiful black soil. I asked for spring planting. I think it should be a little lighter. It is good that the contents are well contained. I have not used it yet. I am satisfied with better quality than I expected. I would like to use it in the future. First of all, it is light. Ideal for hanging basket. Further price is cheap. I purchase about 10 bags at a time. Fluent culture soil, easy to use. The price is reasonable. It was my first time so I ordered it for testing. Although I have not used it yet, the touch feeling seems to be good, I will send you free shipping fee more than anything so try out these items I would like to decide. Things that I planted quickly budded, thank you. I will use it at home. I am using it for transplanting, but the soil of my home is left over, I try to play as much as possible. In troublesome times, I use cultivated soil directly, so I use it when I have no physical strength. Thank you in the future. Potted flowers were smaller in the current flowerpot, so I bought it for replanting. It was very easy to use easily. It was quite good soil. It was very helpful to deliver it. It is cheaper than other mail-order sales, so it arrives soon, so I purchased four bags so far. Suitable for home garden. I think the price is normal, but since it is a heavy item, it will be saved if you deliver it. Considering the trouble, it is a sense of cheapness. Because the price was cheap because it was a manufacturer product, the impression I used was good enough with sufficient quality. I want to purchase again. I think that it is easier to grow compared with the products of the nearby home center. I got into the garden. Satsuki planted blueberries in the garden so I bought eight bags of culture soil. It is a good black soil and growing well with water infiltration well. I cultivate tomatoes and cucumbers while keeping cultivated soil bags. 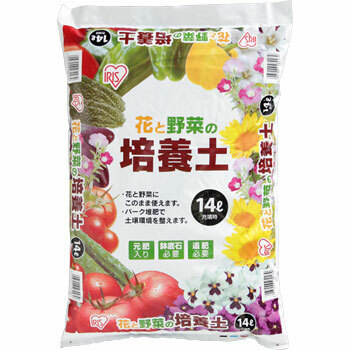 I open the mouth of the bag and grow tomato and cucumber as it is. Just the right size, the quality of the soil is good, it grows well. Products of Iris Oyama have a sense of security of company name. Thank you for getting cheap and delivering home. It's pretty good product. Because it is a stone-covered garden, it is hard for the elderly to dig up. Since I was writing Iris Oyama, the face of the founder came out and ordered. I am sorry for Mr. Monotaro. Why is the price mostly taken by shipping costs and not lost? I would like to make an additional order if it's okay? It is 14 liters and it is easy to handle because it is small. I mixed it with old soil and used it in the planter, but I planted enough.